Jonathan Edwards, was a Puritan Preacher in the 1700s. He was one of the most respected preachers in his day. He attended Yale at the age of thirteen and later went on to become the president of Princeton college. He married his wife Sara in 1727 and they were blessed with eleven children. Every night when Mr. Edwards was home, he would spend an hour conversing with his family and then praying a blessing over each child. Jonathan and his wife Sarah passed on a great, godly legacy to their eleven children. An American educator, A.E. 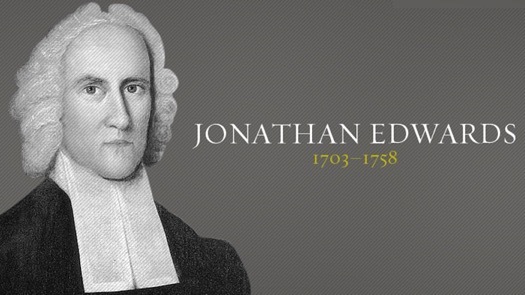 Winship decided to trace the descendants of Jonathan Edwards almost 150 years after his death. His findings are remarkable, especially when compared to another man from the same time period known as Max Jukes. Jonathan Edwards’ legacy includes: 1 U.S. Vice-President, 1 Dean of a law school, 1 dean of a medical school, 3 U.S. Senators, 3 governors, 3 mayors, 13 college presidents, 30 judges, 60 doctors, 65 professors, 75 Military officers, 80 public office holders, 100 lawyers, 100 clergymen, and 285 college graduates. 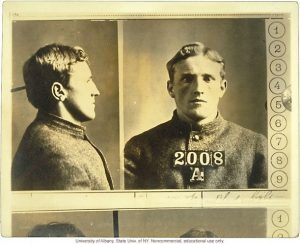 Max Jukes’ legacy came to people’s attention when the family trees of 42 different men in the New York prison system were traced back to him. He lived in New York at about the same period as Edwards. The Jukes family originally was studied by sociologist Richard L. Dugdale in 1877. Jukes’ descendants included: 7 murderers, 60 thieves, 190 prostitutes, 150 other convicts, 310 paupers, and 440 who were physically wrecked by addiction to alcohol. Of the 1,200 descendants that were studied, 300 died prematurely. These contrasting legacies provide an example of what some call the five-generation rule. “How a parent raises their child — the love they give, the values they teach, the emotional environment they offer, the education they provide — influences not only their children but the four generations to follow, either for good or evil.” What a challenging thought! If someone studied your descendants four generations later, what would you want them to discover? 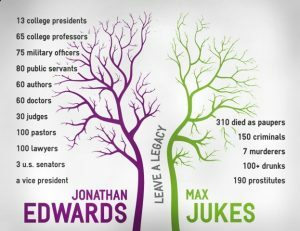 Do you want an Edwards’ legacy or a Jukes’ legacy? The life you live will determine the legacy you leave! Browse our website for Resources and articles to help you build strong family legacies, join us for an event or training, or sign up and get our themed newsletters 5-6 times a year.